I love a great bargain. Really, I get so excited when I find a great product at a great price. Maybe it’s my background as a retail buyer where my job was to shop and negotiate for the best price, or maybe it’s just that I get such a rush when I find a look for less. 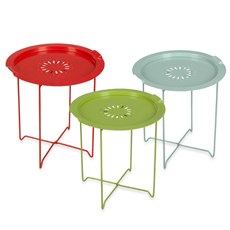 My latest bargain buy are these outdoor accent tables from Bed Bath & Beyond. They come in fun colors, and the price can’t be beat. They also can be used indoors to add a pop of color. If you want a great bargain it’s always best to shop at the end of the season. These tables were $19.99, plus I used the 20% off coupon which brought them to $15.99, and I got an additional 25% off one table since it was a floor sample. Here it is in between 2 neutral outdoor lounge chairs. Now I am on the hunt for the right accent pillows.